Returning to Chino for an installment of the Another Time series, this is the view from the corner of 6th & D Streets, looking northwest at the anchor structure of the block, the former First National Bank of Chino. The original bank structure on this site was erected in 1904 and it was replaced by this structure which was built in 1924 under the supervision of the Pasadena based architectural firm Marston, Van Pelt and Maybury. The only other structure still known (in my research) to exist that is attributed to Marston, Van Pelt and Maybury is a mansion in the San Rafael hills neighborhood of Pasadena. In 1905 A.P. Giannini founded the precursor of the Bank of America, the Bank of Italy in San Francisco. Giannini was the banker who invented the concept of branch banking. In the early years of banking in California and in the United States banks were prohibited by law from having multiple branches. Giannini and others would get around these regulations by merging banks and operating them under holding companies. S0me time later Giannini merged the First National Bank of Chino with his Bank of Italy through his holding company and commissioned the 1924 construction of the First National Bank building which still stands today. In 1930 Giannini renamed his bank holdings Bank of America, after merging his original holdings with the Bank of America in Los Angeles in 1928. The “First National Bank” that is carved in to the pediments of the building, likely was obscured and replaced by “Bank of America” signage during that era. Later in the 20th century Bank of America erected a new banking building three blocks away, at the corner of C Street & Central Avenue, vacating the 6th & D street building. The bank branch at C Street & Central Avenue was eventually closed by Bank of America during a consolidation of branches and that building now houses. In 2000 this building was re-opened as the Chaffee College, Chino Education Center. 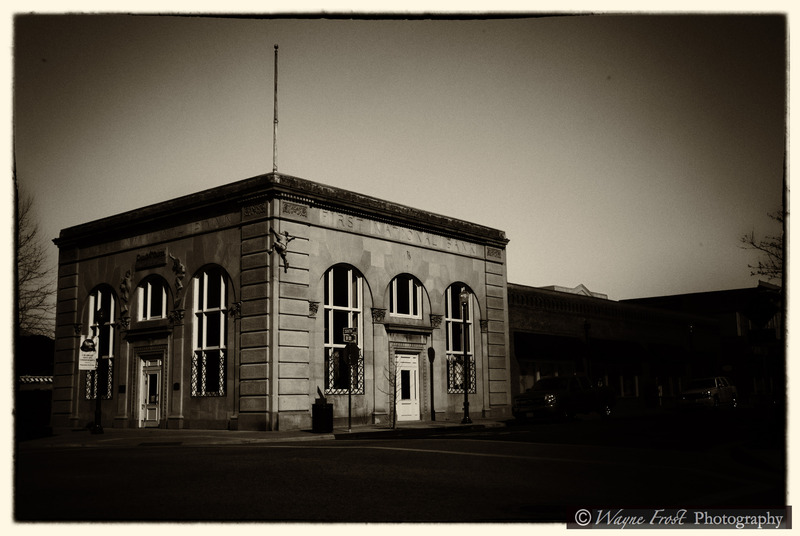 The original First National Bank building changed hands after the bank left it and at one point it served as a component of a local hardware store that was operating in adjacent buildings on the block. In 1996 the city of Chino became interested in the building, eventually acquired it, rehabilitated it, including seismic retrofitting and opened the building as the Chino Youth Museum on December 12, 1999. If you look closely you will see what looks like a small boy scaling the corner of the building, somehow I don’t think any bankers had that in mind when the building was constructed. A hat tip goes to Al McCombs of the Chino Champion for contributing to this post with some of his knowledge of local history.